My easy quinoa recipe for “Quinoa Risotto” was created after reminiscing about what I used to cook when Andy and I were first married back in 2000. I was thinking back to the the risotto recipe I made for our first Christmas Eve dinner. It was a Risotto with Herbs and it was so good that I still remember it all these years later! It was also rather healthy too; the only not-so-healthy ingredient was the Arborio rice. But all traditional risotto recipes are made with Arborio rice. What’s wrong with arborio rice? 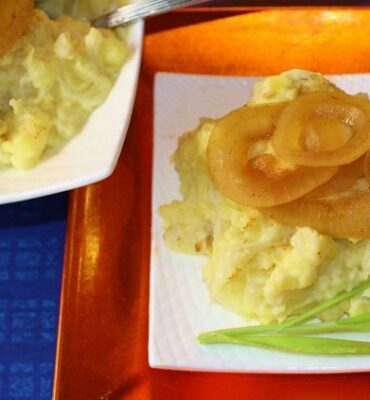 Arborio rice is a short-grain, white rice that readily gives off starch as it is cooked. Arborio rice has the distinction of absorbing flavors very well and achieving the super creamy quality so loved in traditional risotto recipes. The problem with Arborio rice is that it is a fiber-poor, refined grain and not exactly a nutrient-dense food source. It’s pretty much just an empty-calorie carbohydrate. What can be substituted for arborio rice? 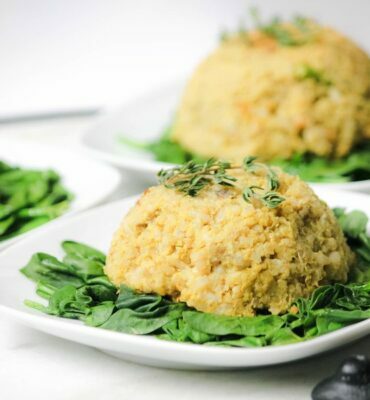 Any short whole grain rice can be used as a substitute for Arborio rice in risotto recipes. Short grain brown rice or even ultra-nutritious, antioxidant-rich black rice or Himalayan Red can be substituted for Arborio rice. Not only is “Quinoa Risotto” recipe far healthier than traditional risotto recipes, it still offers the same rich and creamy comfort-food deliciousness. 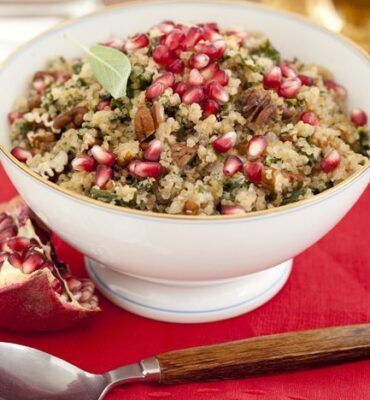 And, just like the Arborio rice, the quinoa soaks up the flavors of the vegetables, herbs and garlic. 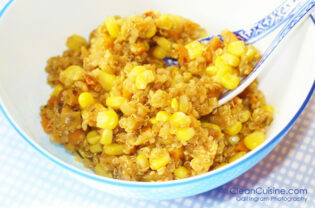 This easy quinoa recipe is hearty enough to be served as a side dish or even as an entree. If you are serving your risotto as an entree and want to make it a bit heartier, try topping it with a soft boiled pastured egg. Enjoy! Bring the broth to a boil in a small saucepan over high heat. Reduce heat to maintain a steady simmer. Place leeks in a food processor and shred. Repeat with carrots. Set aside. Heat the oil in a large, heavy saucepan over medium-high heat; add garlic and sauté 30 seconds. 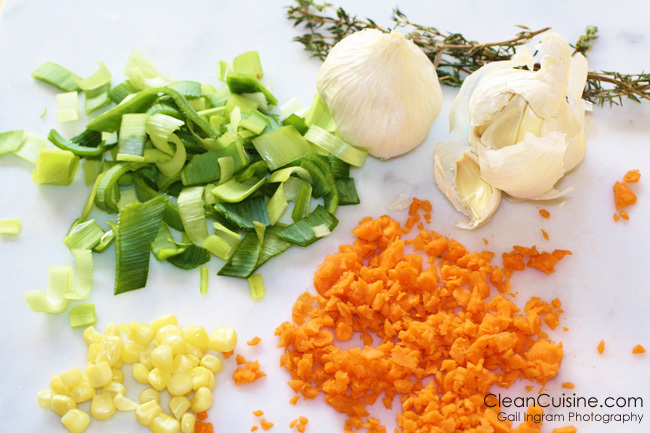 Add shredded leeks and carrots and sauté 3-4 minutes, or until tender. Season vegetables lightly with salt. Add the rice and quinoa to the saucepan and cook, stirring constantly, for about 2 minutes. Sprinkle the thyme on top of the grains. Add the Chardonnay; stirring until liquid evaporates. Ladle 1/2 cup of the hot broth into the pan with the grains and add the tomatoes, stirring constantly. Continue adding the broth, 1/2 cup at a time, and continue periodically stirring until the liquid has been absorbed before adding each subsequent 1/2 cup of water. Cook the grains over medium heat for about 25 minutes, or until all liquid is absorbed, stirring frequently so the grains do not stick to the pan. Remove the pan from the heat and stir in the semi-thawed corn kernels; cover the pan and let the risotto sit for 15 minutes before serving. You can also make this recipe without using any brown rice by simply increasing the amount of quinoa to 1 cup. Ivy have you tried freezing this recipe??? Wonder if it would be ok to freeze it in portion sizes?? Sounds yummy, I’m definitely going to give it a try. I haven’t tried freezing this dish (I do freeze chili all the time though) but I’m 90% sure that would work fine! If you do freeze it please let me know if it’s still good re-heated. Is there something i can use to replace the Chardonnay? …more veg broth i guess? Hi Jaime! yes, more veg broth can easily replace the Chardonay!! I just made this for the second time tonight, and it is SO delicious. It’s all I can do to prevent myself from eating it out of the pan while it sits those last fifteen minutes. Thank you so much for the recipe! Out of curiosity, why do you cook with olive oil rather than coconut oil for this dish? 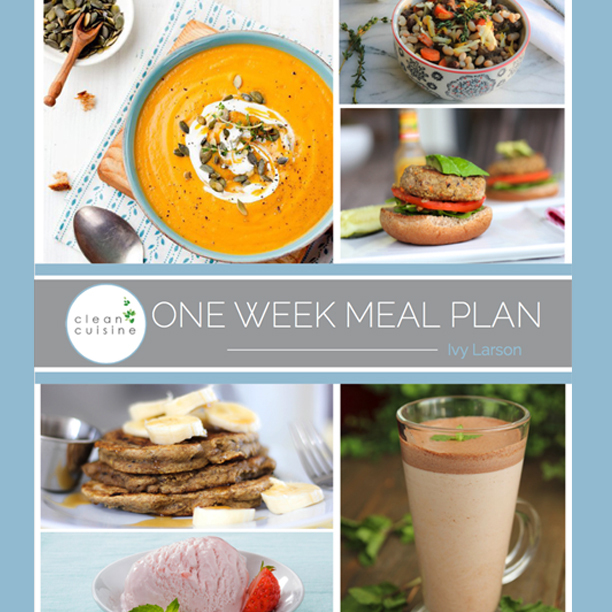 Made this and my family loved it – including my two toddlers who virtually licked their plates! I ran out of quinoa, so I substituted millet with the arborio rice and it came out great and it’s still very nutritious. Delicious! I’ll be making my risotto this way from now on. Thank you!